In the month of Ramadan it is very important that we spent a few moments to understand some of the wisdoms and lessons that we can learn from this month of fasting. Unfortunately, many Muslims come in to this month and they are as a companion of the Prophet, peace be upon him, said: "Let it not be that the day that you fast and the day that you break fast be equal." Meaning, one's behaviour, attitude and outlook are the same whether one fasts or not, i.e. fasting has no effect upon that person. This is why we need to reflect on some of these lessons. Allah legislated fasting for gaining Taqwa, "O you who believe, fasting has been prescribed upon you as it has been prescribed upon those before you, so that you may attain Taqwa." (meaning of Soraatul Baqarah (2):183) Taqwa in this case means to make a shield between oneself and Allah's anger and Hellfire. So we should ask ourselves, when we break our fasts, 'Has this fasting day made us fear Allah more? Has it resulted that we want to protect ourselves from the hellfire or not? This is achieved by reciting and reflecting on the Qur'an during night and day, attending the taraaweeh prayers, remembering Allah, sitting in circles of knowledge and, for those who can, making `umrah. Also for those who can, making I`tikaaf (seclusion) in the last ten nights of Ramadan, so as to leave all worldly pursuits and seclude oneself in a masjid just thinking of Allah, so as to bring oneself closer to Allah . When one sins, one feels distant from Allah. That is why one might find it heard to read the Qur'an and come to the masjid. However, the obedient worshipper feels closer to Allah and wants to worship Allah more, because he is not shy from his sins. Allah has mentioned patience more than seventy times in the Qur'an and has commanded patience in more than sixteen ways in His Book. So when one fasts, and gives up one's food and drink, and one's marital sexual relations for those hours, one learns restraint and patience. This Ummah needs man and women that are strong willed, who can stand upon the Sunnah and the Book of Allah and not waver in front of the enemies of Allah. We do not need emotional people, who just raise slogans and shout, but when the time comes to stand upon something firm, they cannot do so, they waver. Ihsaan means to worship Allah as if one seeks Him, and even though one does not see Him, He sees all. Hasan al-Basree said, "By Allah, in the last twenty years, I have not said a word or taken something with my hand or refrained to take something with my hand or stepped forth or stepped back, except that I have thought before I have done any action, 'Does Allah love this action? Is Allah pleased with this action?' So when one is fasting, one should gain this quality of watching oneself and also staying away from riyaa' (showing off). That is why Allah said in a hadeeth qudsee, "Fasting is for Me and I reward it." (al-Bukhaaree) Allah singles out fasting from all other types of worship saying, "Fasting is for Me", because no one knows whether you are fasting or not, except Allah. For example, when one is praying or giving charity or making tawaaf, one can be seen by the people, so one might do the action seeking the praise of the people. 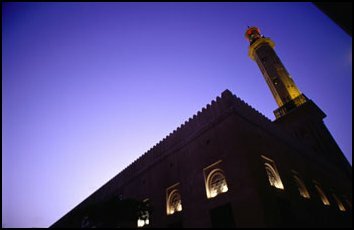 Sufyaan ath-Thawree used to spend the nights and the days crying and the people used to ask him, "Why do you cry, is it due to the fear of Allah? He said, 'No.' They said, "Is it due to the fear of the Hellfire?" He said, 'No. It is not the fear of Hellfire that makes me cry, what makes me cry is that I have been worshipping Allah all these years and doing scholarly teaching, and I am not certain that my intentions are purely for Allah.'" LESSON 5: Refinement of manners, especially those related to truthfulness and discharging trusts. The Prophet (may Allah send His blessing and peace upon him) said, "Whoever does not abandon falsehood in word and action, then Allah has no need that he should leave his food and drink." (al-Bukhaaree) What we learn from this, is that we must pay attention to the purification of our manners. The Prophet (may Allah send His blessing and peace upon him) said, "was sent to perfect good manners." (Maalik) So we must check ourselves, are we following the behaviour of the Prophet (may Allah send His blessing and peace upon him)? For example: Do we give salaam to those we don't know and those we do know? Do we follow the manners of Islam, by telling the truth and only telling the truth? Are we sincere? Are we merciful to the creation? The Prophet (may Allah send His blessing and peace upon him) said, "Every son of Adam sins and the best of the sinners are those who repent." (Ibn Maajah) Allah provides many opportunities to repent to Him and seek His forgiveness. If one was disobedient they can become obedient. The Prophet (may Allah send His blessing and peace upon him) said, ".Those of you who will live after me will see many differences. Then you must cling to my Sunnah and the Sunnah of the rightly guided khaleefahs. Hold fast to it and stick to it." (Aboo Daawood) In this month we sense that there is a possibility for unity, because we all fast together, we break fast together, we all worship Allah together, and we pray Salaatul-`Eid together. Therefore we sense that the unity of possible. It is possible for Muslims to be a single body, but this will only be achieved when obedience is only to Allah and His Messenger. The Prophet (ma Allah send His blessing and peace upon him) made us adhere to discipline and strictness, strictness that does not lead to fanaticism or going outside the bounds that Allah has laid down. One cannot knowingly break the fast before the sunset, as this will not be accepted by Allah. Muslims should learn to be very strict in their lives, because they are people of an important message, which they mold their lives around.